Paola and Peter at the helm of Nanuq. 8 Aug 2018 – Text by Paola Catapano. Nanuq in from of Lilliehöökbreen. We cast off from Ny Alesund harbour at 10.25 UTC while the big cruiser Hurtigruten entered the harbour with its load of tourists. Another consequence of global warming is the increase of tourists to the Svalbard archipelago. 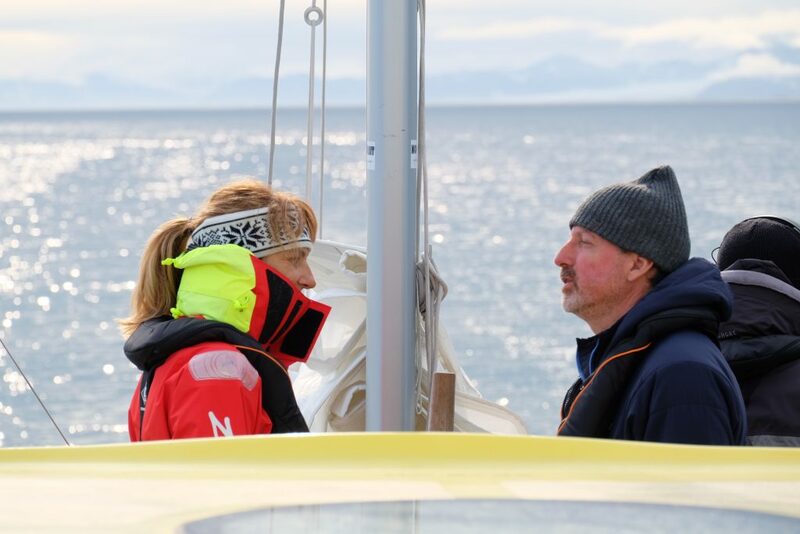 Peter gave me the honour of the helm for this first sail out of Ny Alesund and it was great to slalom among ice blocks and the long waves. Just out of Ny Alesund we saw – barely visible – the Royal yacht to whom we have waved goodbye yesterday. It was white against the white glacier behind it, protected by a grey Coastguard ship barely visible before the grey mountain. 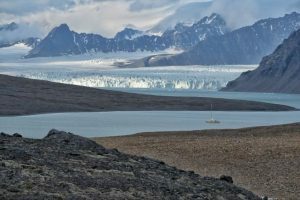 To avoid 48 hours of sailing with strong wind in the nose and waves, the Captain decided to aim for a mooring in the nearby Krossfjorden, a stunning bay marked by alpine-looking peaks cut right below their summits, vomiting their glaciers into the sea. We anchor in the middle of Lilliehookfjord, a round bay marked on one side by the ominous glacier – regularly thundering its icebergs in the water – and on the other by a lunar array of grey peaks which look like the back of a dinosaur. We took the tender to go for a walk in two groups, without forgetting the polar bear threat. One rifle and flare pistol per group and hand flares for all. Very soon on our trail, signs of a wild feast give reason to our discipline, as we step into the freshly eaten remains of a reindeer, its full head left with its beautiful array of horns and on the other side one leg with fur still on its foot. The remains are standing in the middle of the rusting remains of a German weather station built here by the “KriegsMarine” in 1945. Flying our small drone over the only battle field in Svalbard also gives us security that no polar bears are lurking behind the peaks and stones. On the way back, Ombretta found more reindeer horns – this time victims of the plastics of fishermen nets. These are possibly the main source of plastic pollution in the oceans. Safiria found the same thing on the other side of the bay where she went with Gianluca who performed the first arial photogrammetry of the trip with his phantom 4. They also found the time to collect some ice from the Lilliehöökbreen that we used to have a Martini on board just before dinner.